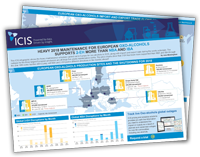 This ICIS infographic shows the heavy maintenance schedule carried out in Europe for oxo-alcohols in 2018, along with import and export data during the works schedule. The outages for the three largest European producers are all large five-yearly maintenance works. The price charts show that 2-EH has been more supported than NBA and IBA through the year. With some hurdles still to jump, will NBA and 2EH pull in different directions in the months ahead?